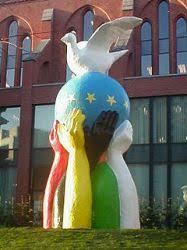 Image the "Statue of Europe" which is also known as "Unity in Peace". It has an interesting history in itself and matches pretty well my idea behind the music. I did not record these lyrics since I cannot sing like a choir. But sing along.